Cats are fun pets to have. They tend to be quite loyal, they can be affectionate, and they certainly provide for some entertainment. However, with that being said, they are also somewhat demanding and can cause trouble too. If you have a cat, chances are that it’s always lounging on your furniture, and more likely than not, your upholstery has suffered from some clawing and scratching. If this is the case in your home, it might be time to look into a cat scratcher and lounger combo, something like the New Cat Condos Premier Cat Scratch and Lounge. Today we are here to review the New Cat Condos Premier Cat Scratch and Lounge. This is a moderately priced cat scratch post and lounge combination that should keep your cat happy, provide it with various lounging spots of different heights, and will provide it with something to claw and scratch, thus keeping your furniture safe. It might seem a bit pricey for what it is, but it is quite useful, it’s made to be durable and long lasting, and it will help protect your furniture. The New Cat Condos Premier Cat Scratch and Lounge is something you would get if you have a cat that tends to leave hair all over your sofa, and even worse, scratches up your belongings. Simply put, if you want to spoil your cat, keep it off your furniture, and keep those claws away from your sofa, the New Cat Condos Premier Cat Scratch and Lounge is something you might want to look into. When you purchase the New Cat Condos Premier Cat Scratch and Lounge, you get a medium-sized, 3-tier, carpet-covered cat lounge and scratch post combo, and yes, the scratching post is made with premium sisal rope so it lasts for quite some time. The New Cat Condos Premier Cat Scratch and Lounge is 20 x 20 x 32 inches, so it is a decent size. We would say that it is a good size for a single cat, but probably not to share, as it is not overly large. However, it comes with the advantage that it doesn’t take up too much room in your home and can be easily placed anywhere without getting in the way. The New Cat Condos Premier Cat Scratch and Lounge features 3 separate levels for your cat to lounge on and take a break. There is a bottom and middle layer, both of which feature cylindrical hangout spots which are open at the top and rounded at the sides, kind of like a can of soda cut in half and laid on its side. Cats seem to like this as they can get comfy in there. The top tier is more of a bird’s eye perch, a square one where your cat can lay down if desired, but chances are your cat will spend its time up there looking down on what’s going on around its domain. All of the New Cat Condos Premier Cat Scratch and Lounge is covered in plush household-grade carpet. It is more than soft enough for your cat to be comfortable, yet also durable enough so that it should not come apart just from a few angry clawing sessions. Furthermore, to make sure that your cat doesn’t scratch where it shouldn’t be clawing, the New Cat Condos Premier Cat Scratch and Lounge comes with a fairly large sisal rope scratching post section. The sisal rope used here is not oiled, is all natural, and is therefore not harmful to your cat, but be aware that it does fray a bit and make a bit of a mess, especially as time goes on, but if you know what you are doing, you can actually replace it when it gets old. At the very least, it will keep your cat’s claws busy, well kept, and away from your valuable furniture. What you might also appreciate about the New Cat Condos Premier Cat Scratch and Lounge is that all of the posts and the base, as well as the perches, are made out of solid wood. It’s a pretty big deal because it ensures that this item is sturdy and durable, more than strong enough to last for years to come, even with a wild and crazy cat. Solid wood does make this thing quite heavy, well over 40 pounds, so while it might be a bit of a pain to move around in your home, you can rest assured that it won’t tip over if your cat is being rowdy on it. Quite honestly, there is really nothing to say in ways of a tutorial here. The New Cat Condos Premier Cat Scratch and Lounge comes fully assembled, so there is none of that mess for you to deal with. Simply place it where your cat will enjoy it, or wherever else you want it to be, and watch as your cat has the time of its life. There are of course many cat loungers and scratch posts which you can consider, with one of them being the CozyCatFurniture 33″ Cat Condo. It’s about the same size as the product we reviewed here today, but the bottom actually features a little house, or almost like a little castle where your cat can hide in and get some privacy, plus it even comes with a hanging toy for fun. 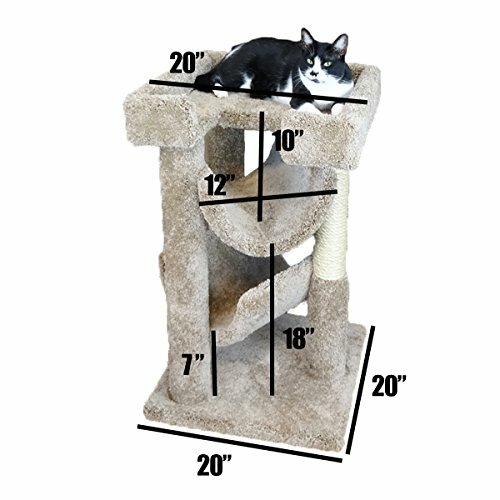 When all is said and done, we think that the New Cat Condos Premier Cat Scratch and Lounge is a very smart investment for any cat owner to make. Yes, it’s going to cost you more than other models, but with that said, it’s still much cheaper than having your cat claw apart curtains, pillows, and everything in between. Moreover, it is also surprisingly durable, it has 3 lounging stations, and a scratch post too. At the very least, it should keep your cat quite happy and occupied.